People I need some help. I have been looking through the forum here but could not find the solution. When I am using a Priority path the normal que gets blocked up. People will keep waiting for the entrance of the Priority path and when the normal que walks further they walk on. They do this even if there is still up to 2/3 tiles of space left. How can I get this solved. It looks so strange in a park. I hope you all get what I mean. if not I will post a screenshot. not sure if this is what you are talking about or not. The junction where the priority path joins back into the normal queue...the guests in the normal queue will stop. This is because if someone is in the priority, they get to go first. If no one is in the pri lane...they still stop in the normal queue until the loading station is open in front of them to continue on. You should be sure to put the junction as close to the load platform/gate so that you don't have a bunch of open unused queue line space. This is by design. PaterDave, a picture would help. Anyway, the way things normally work, the peeps in the regular queue stop just short of where the priority queue merges into it. 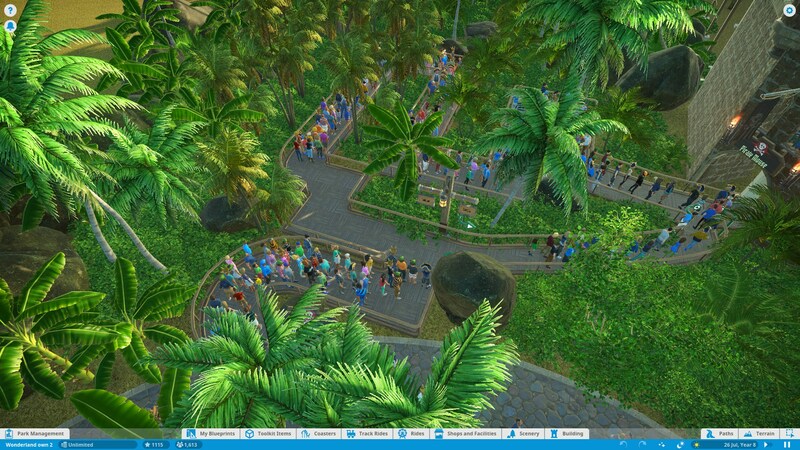 This allows priority peeps to cut ahead of them as the queue as a whole moves. If thee are no peeps in the priority queue, then the next peeps in the regular queue move up across the priority queue merge. So in general, there's usually a gap between the priority queue exit and the last peep in the regular queue downstream of there. This is all impacted by your priority pass settings, which I think you select at the info booth that sells the passes. The default IIRC is equal, so that 1 group from the priority queue merges in, then 1 group from the regular queue moves up. But you can change this to greatly favor the priority queue, in which case the regular queue won't move up as fast. Might want to check your priority pass settings. Thanks for the replies but I meant that my problem starts at the beginning of the priority lane. I have placed a screenshot here so you guys can see what I mean. Is this just a problem in PC or is it some thing I am doing wrong?? As you can see the beginning of the path is completely full and than behind the beginning of the priority lane it is empty for an 4/5 pathpieces. Even when the prio lane is empty and not half full as it is now I have this Problem. Hmmm... This does not accure in my parks, maybe you should adress this as a bug. This is not intended behaviour (at least, this does not happen in my parks). Yeah, this is not how things are supposed to work. I'd report it as a bug. Note that there have recently been other bugs with priority queues so this is probably related.